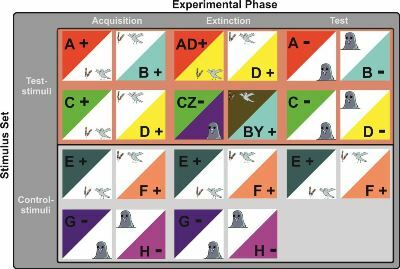 SFB 1280 Extinction Learning - accepted! For two years we worked hard, read hundreds of publications, discussed endlessly our studies that we want to pursue, wrote a 400 page application, prepared ourselves for possible questions, rehearsed each minute of every presentation several times, furnished the relevant rooms, and then they came: the reviewers as well as the representatives of the DFG. On the 11th and the 12th of January 2017 we were evaluated thoroughly and fairly. On the early afternoon of January 12 Dagmar Timmann-Braun and Onur Güntürkün were then invited to receive the final decision: POSITIVE!!! The reviewers were very enthusiastic about our approach, our organization, and our science. Their financial cuts were very modest. Unfortunately we lost one project. By and large, it was a huge success. But obviously the reviewers can’t speak the final word. Thus is spoken in the DFG Senate Commission on May 24. So, let’s wait; fingers crossed. Julian Packheiser receives treasure chest-support! With 4.000€ of our research group he can realize his investigations on the influence of over-estimation on extinction learning. The idea came to his mind while following Metin Üngörs explanations during the Lab Day in Marburg: Metin had mentioned one of the first, but still powerful models of learning. The Rescorla-Wagner model (1972) uses only four variables to calculate behaviour in classical conditioning setups, which makes it incredibly useful to compare human and non-human learning. "What you see is what you get? – Testing predictions of overexpectation derived from the Rescorla-Wagner model" is now the title of his study. Julian's pigeons will learn that for pecking on a certain sign they receive food. Delicious food. The same kind as for choosing a second sign, they will therefore remember well. Wouldn't now a pigeon as well as human expect to get the double amount of treats for finding both signs printed together? But what happens, if nothing happens? Or only one retreat comes out? How much will the the little birds in Bochum, and later a human proband in Marburg, loose their interest in a stimulus, and what does that tell us about the intesting limits of the R-W model, that is the endeavor Julian discovered for himself. Good luck, Julian! Young Scientists enjoyed a Lab Day with our colleagues at the University of Marburg. "That is such a awesome useful masterpiece of logic!" and "...Honestly - I don't know what it means", that is what a doctoral student sometimes exhiles, being faced with the work of project 4. Our group in Marburg, titled "the role of attention in renewal", does outstanding work in the field of learning. "Learning is if what happens does not match the expectation we had", Harald Lachnit and Metin Üngör sometimes summarize the theory of learning for me. But they also explain and even calculate learning effects with an impressive set of mathematical reflections. 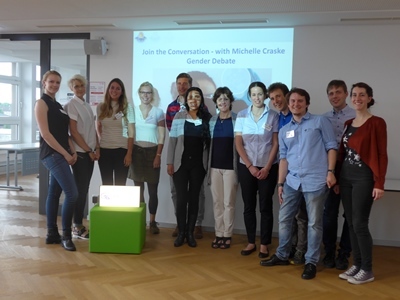 How they bridge these apparant gap became much clearer to our young researchers at the 25th of April, when we visited them in Marburg. Dear Harald, dear Metin, thank you very much for this great expedition! 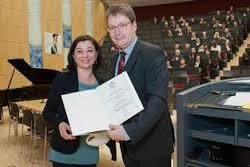 Adriane Icenhour received the promotional price of the Faculty of Medicine! 60 doctor's degrees, 40 of them for woman, and Adriane's was the most outstanding one. We are all so very proud of you! Adriane has been one of the first students involved in our research group. Since 2012, from our early days, she has been involved in project 7, "Neural Mechanisms of Learning and Extinction in Visceral Pain". Now Adriane excellently did her PhD on " Central Nervous mechanisms of pain associated learning processes in abdominal pain: findings in healthy subjects and patients with irritable bowel syndrome ". Regrettably we have to wait doing a toast at her: She currently stays as a Postdoctoral Research Associate at the University of Linköping. Psychologist Michelle Craske from the University of California, Los Angeles (UCLA), is one of the most important researchers in the field of fear, anxiety and anxiety disorders. Her work essentially influences the development of psychological treatments of anxiety disorders and depression, targeting factors from neural circuitries to psychophysiological, behavioral, and cognitive responses. She is told to be on the cutting edge of exposure research. Her work has undermined the traditional notion posited in the emotional processing theory that habituation to a feared stimulus is important in exposure work. 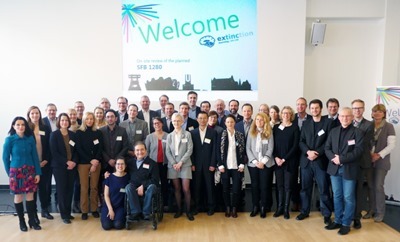 At June, the 21st she spent one day in Bochum, following the invitation of Professor Schneider, Professor Margraf and the FBZ, as well of Professor Güntürkün and the Extinction Learning Research Group. Our Research Group Extinction Learning, the workshop of the Faculty of Psychology, together with the Family Service "Pro-Kids" and the Equal Opportunities Office built a mobile children room. The mobile room is suitable for children up to primary school age. It looks like a colorful chest of drawers on wheels. Behind every (safe for children to open) door or drawer something is hidden that can enlarge children's eyes: puzzle, puppets, blocks, books, paper, pens, games and so on. Furthermore it has a changing station, a folding table, chair, tent and a travel cot, which can be used as a playpen. The prototype of the mobile nursery was actually crash tested for the first time on its suitability for everyday use. Two weeks long the one- to three-year-old children of our day care group "Uni-Dwarfs" reviewed the furniture. Right from the beginning it became pretty clear: The mobile children room is very popular. It even has enough toys and other distraction for a dozen children at a time - a fortiori for one. The Dwarfs have now pronounced their unerring judgment; with a little help of their nurses. Currently installing their improvements the furniture can henceforth start its career as a back-up care! Welcome kids-at-work, and cross finger's that the mobile children space will work out well - is worth a shot. The "Treasure Chest" for Young Scientists gets more and more value for our Young Scientists! Into the new year three applications passed the criticism of the Executive Board of the research group 1581. Congratulations to Anne Golisch, Thomas Ernst and Sara Lucke! The "treasure chest of explorations" is an individual tool of the FOR1581, where PhD students and young postdocs can apply for a funding of their very own research studies. Thereby we keep promoting the independence of our young researchers and support them profiling own theories. This time, Thomas runs a MRI-pilot study on the influence of the cerebellum to fear-reactions, Sara will exploit the possibilities of a new therapy of trauma-related fear, while the youngest of them, Anne, seeks to provide crucial information about the meaning of timing on renewal. Thank you, our Young Scientists of DFG-Research Unit FOR1581! 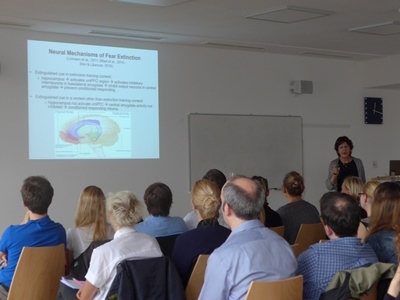 The 2nd Symposium on "Extinction Learning: Neural Mechanisms, Behavioral Manifestations and Clinical Implications" turned out as a full success. Between the 16th-17th November 2015 seven outstanding lecturers of their field discussed a wide range of aspects about extinction at the Beckmanns Hof of Ruhr-University Bochum. Attached you find the information brochure with abstracts of the presented talks an little CVs of hosts and guests. We cordially invite you to participate in 2nd Symposium "Extinction Learning: Neural Mechanisms, Behavioral Manifestations and Clinical Implications". This two-day symposium, hosted by the Young Scientists of DFG-Reasearch Unit FOR1581, will be held Monday, November 16th (9am, registration - 6pm) and Tuesday, November 17th (10am - 5pm) at the Beckmanns Hof of Ruhr-University Bochum. Attached you find the provisional invitation for the meeting. We are looking forward to an intense meeting, sharing expertises and ideas with international recommended lecturers in the field. Please feel free to forward this invitation to other researchers and students who might be interested. We are proud to announce the talk of Javier Medina here in Essen. Javier will discuss the "The role of the inferior olive in extinction of Pavlovian eyeblink responses" with us. His lecture is part of a series of international lectures, organized with support of the FOR15812 by our collegues Dagmar Timmann-Braun and Sigrid Elsenbruch. For two intense days 50 reseachers did nothing but think about the implications of extinction-research. The network of FOR1581 got together to discuss current findings and new perspectives. Following the Motto "The Past, the Present and the Future" our market of ideas came out with sustainable effects on our upcomming work. Thanks for sharing a good time! DFG approves 3-year extension of funding for research unit on extinction learning Read more! The Program of our Young-Scientists Symposium is finalised! From the 25th – 26th November 2013 we heartly invite you to register for our symposium Extinction Learning: Neural Mechanisms, Behavioral Manifestations and Clinical Implications. The aim of this symposium is to bring together researchers from different disciplines to discuss their latest research on extinction learning. The symposium is being organized completely by the Young Scientists of our research group. 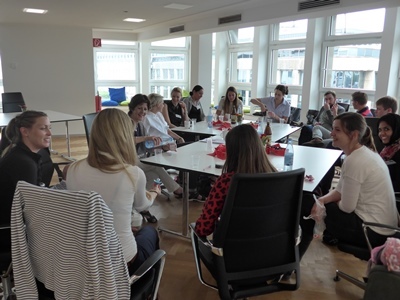 They are very happy that top researchers like Steven Maren, Mohammed Milad and five more recognized experts followed their invitation and come to discuss their recent ideas with us in a relaxed yet stimulation atmosphere. We hope to welcome you at the Symposium as curious listeners soon! Congratulation, Kathrin! For her Pilot Studie about transferring the methods of pharmacological interferences in neural mechanisms of the pigeon on to rats, she successfully applied for an extra founding by our DFG-founded treasure-program. Kathrin Orlowski will now manage a little cooperation between Subgroup 1 (“Combining cells and behavior: Neuronal foundations of extinction and renewal”) and her Subgroup 3 (“Extinction and renewal in behaviorally conditioned immunosuppression”). 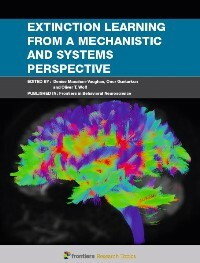 Learning and memory: mechanisms, functional correlates, control and extinction. (in cooperation with SFB 874 and Extinction Learning Group). Congratulations Sarah Starosta! Sarah’s proposal for funds from the „Exploratory Treasure“ got accepted. She will conduct a behavioral experiment on the “Influence of attention on the context‐specificity of acquisition and extinction learning”. New Project! The DFG granted funds for a 9th project of the Research Group Extinction Learning: “Clinical Implications of Extinction Learning and Renewal in Specific Phobia”. Congratulations: Armin Zlomuzica, Silvia Schneider, Jürgen Margraf and Dirk Adolph. Welcome to our group! 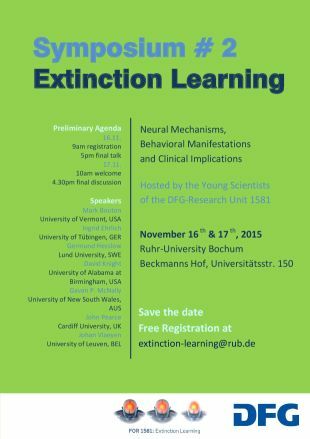 Proposal for the DFG Research Unit "Extinction Learning" accepted! It is official!! The DFG accepted our joint research proposal. For a total of 3 years (2011-2014) the research unit will receive funding to conduct research. Spokesman is Onur Güntürkün (Ruhr-University Bochum). Manfred Schedlowski (University Clinic Essen) and Harald Lachnit (Philipps University Marburg) are the associative spokesmen. To provide a most recent update on research on extinction learning, Denise Manahan-Vaughan, Onur Güntürkün and Oliver Wolf from the Ruhr-University came together to create an open-access Frontier Research Topic e-book.